In July 2009, along with thousands of other Melburnians of a certain age, I queued up on a cold St Kilda night to see celebrated British comedy duo French & Saunders at the Palais Theatre as part of their "farewell" tour. The show was a relatively safe "best of" collection of sketches, and the Palais wasn't the ideal venue (far too big for their style of comedy), but it felt like we were there to pay affectionate homage as much as to be entertained. 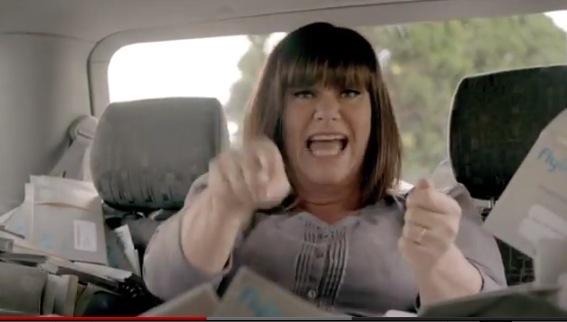 Never in a million years could I have guessed that Dawn French's next major appearance in Australia would be in a truly awful ad campaign for the Coles supermarket chain's re-vamped "Fly Buys" loyalty program. I've always thought of Dawn French as one of Britain's more socially-attuned comedians, since her days as part of the Comic Strip working with the likes of Adrian Edmonson, Rik Mayall and Alexei Sayle in the 1980s. It strikes me as particularly odd, then, that she would sign on to front a "loyalty" (read "profit-maximizing") program for one of a cosy pair of duopolists whose immense market power and savage pricing policies are widely held to be matters of serious concern by everyone from the ACCC to the National Farmers' Federation and Prime Minister Gillard. While I don't expect someone like French to keep abreast of issues in Australian consumer economics and and trade practices, I'd have thought that she (or someone advising her) should at least have sussed out the situation with a view to gauging public sentiment and likely audience response before signing on. It's pretty fair to say that Coles is not regarded with the same affection as French is by most consumers... or at least as French was. And the allegedly humorous scripts for the TVCs themselves - including a FlyBuys teaser and an introduction to the My5 deal - must make them about the unfunniest things with which Dawn French has ever associated herself. Look, it's not enough simply to put Dawn French on camera and tell her to be wacky and crazy. Her very significant body of work over more than three decades has been based on exceptional comedy writing, but there's none of that in evidence in this campaign. Her delivery just seems manic, as if the director believed that louder and wackier must necessarily be funnier. And her flirting with Curtis Stone completely lacks the qualities she brought to the screen as Geraldine, the Vicar of Dibley (sensitively written for her by Richard Curtis and his collaborators). And I am really struggling to follow Coles' strategy in choosing to parachute Dawn French in to tell Australians why they should be more loyal to Coles. She's likeable, sure, but just how does a wealthy, successful English woman with a 40-room mansion in Cornwall relate to the average Australian suburban supermarket shopper? Overall, the whole thing makes me very disappointed. 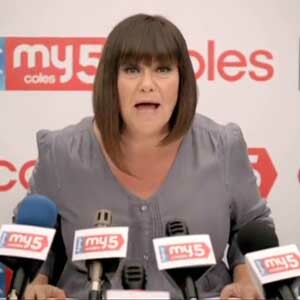 I certainly think no more highly of Coles and its loyalty program as a result of of the ads... and, sadly, I think a lot less of Dawn French for having done them. If only I had a Woolies closer to where I live. Dawn French is not very funny and not exactly a great spokeswoman for a healthy lifestyle. Then again she would amass quite a few points I imagine. Should have gone for Hughesy. The QBrand QBlog rises again!